← New Pietenpol, Gary Boothe, Cool, Calif. Continuing on the Pietenpol theme, we present round three of California Corvair powered Pietenpols. This magnificent bird is the work of Mike Groah and his father Vic. It has been flying a little less than 6 months. Get a good look at the workmanship in the photos, it is outstanding. Above, the side view of a first class aircraft. Note the high deck angle provided by the full length gear legs. We flew our Piet with both short and very log legs. The additional angle of attack available with longer legs lets the aircraft land substantially slower in the three-point position. 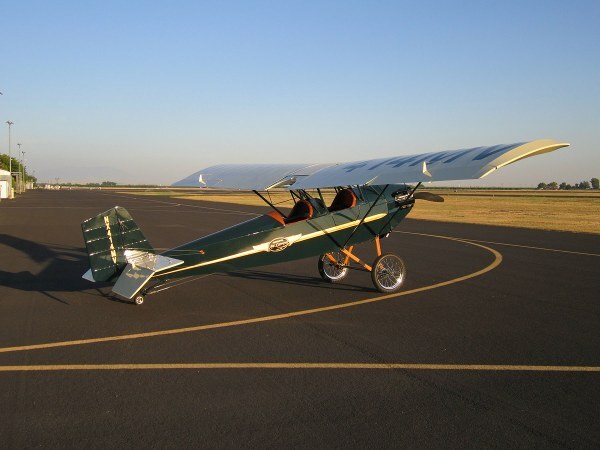 It also allows for a shorter take off technique. I personally like the look better. Photo from the front. A very nice choice of colors. Mike and his Dad Vic. Mike has said that one of the greatest things about the four-year build was that it gave him and his father a chance to spend a lot of time together than they would have otherwise. It is interesting that Fathers in their 40’s all want to get their sons involved in their building; Sons in their 40’s want to get their Fathers involved. Hats off to Mike for actually doing what a lot of us would like to. Above, a very clean and well-organized engine bay. The engine has a front starter, but the alternator is a rear belt drive unit where the stock oil cooler was. 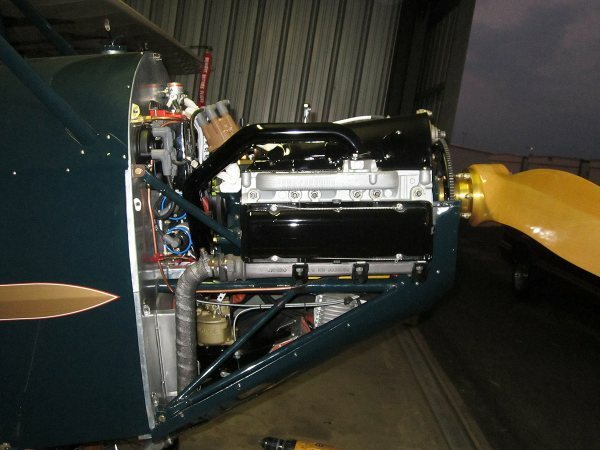 Moving the alternator to the back does tend to clean up the front of a Corvair powered plane that is using J-3 style ‘eyebrow’ cooling ducts. While a gold hub, oil filter housing, starter brackets, E/P distributor and sandwich are visible, the parts that really set this installation apart are the things that were carefully had fabricated for this specific plane. I spent a lot of time looking at this photo and the one below. There is a lot of attention to detail that you may not notice until you have installed your own Corvair. Above, the side view. A few months back I wrote a story about Pietenpol thrust lines. Mike’s mount has the traditional height as designed by the master himself, BHP. The two screws on the left, on the boot cowl, are the height of the longeron. The traditional mount has the thrust line about 3.5″ below this. Original Corvair installations with blower fans needed the engine to ride this low for clearance. We flew our Piet with mounts of this thrust line and also with the engine moved up 3″ in the airframe. Both locations work; go back and look at the earlier article to compare the side views of the aircraft. The carb is the photo is an MA-3, the exhaust is stock iron manifolds. The intake is a custom unit that Mike made. Although there is a lot of stuff in the photo, it is well-organized. The top photo shows that the plane has a large header tank in the cowl. If a piet has just a wing tank it has a lot less fuel, but the space behind the firewall can be used to house the battery and ignition system components. The two blue items are Bosch 0012 ignition coils, the ones I prefer for the Corvair. Above, a good look at “the office.” certainly some very nice workmanship here also. 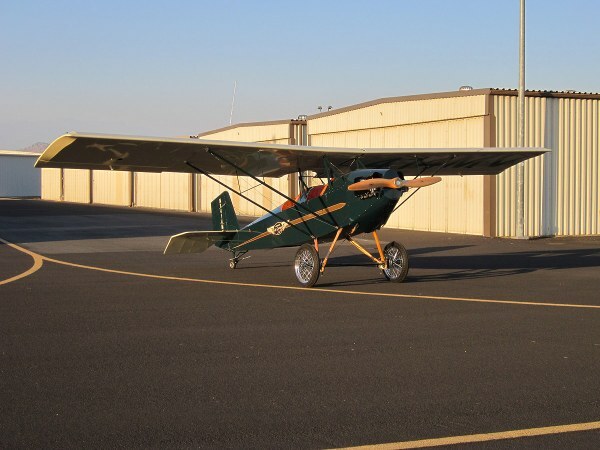 Years ago, aircraft with other automotive conversion engines were very often some of the poorest looking examples of each particular airframe. Many of the people attracted to alternative engines seemed to care very little about quality and appearance of their airframe, almost as if it was some kind of inconsequential stand that followed their engine around. Many of these aircraft, especially ones with belt drives, or liquid cooled engines or radiator installations that were an after thought or reworked many times, had particularly ugly cowls. Oddly, many engine guru’s themselves also had slipshod and disorganized engine on their own aircraft. (Mikes engine compartment is nicer than 95% of the Subaru installations owned by ‘gurus’ of that brand in the 1990s) I attributed this to many of these people really being ground based engine guys who cared little about traditional aircraft quality and organization, and even less about flight performance. If you listened to them speak at the time, a common thread was a naive disrespect for certified engines (calling them Lycosaurus, etc) and a level of venom for regular aircraft mechanics and the skills they exercised. These people were often vehemently opposed to learning anything from traditional aviation, even if ignoring it directly endangered them or people who followed them. It was Ego before Safety, and I can think of several of them that paid with their lives for this attitude. fortunately, the Corvair movement has been spared these ills. 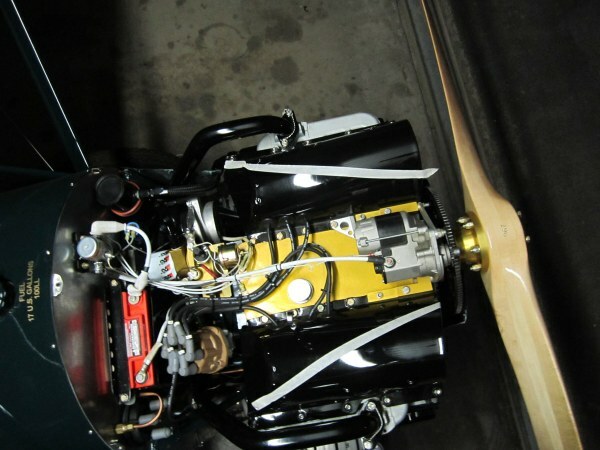 The fact that the engine is air-cooled, narrow, free of a blunt belt drive and shaped like traditional aircraft engine gives us all a great running start of good-looking cowls that function well and clean engine installations. As the most outspoken person in the land of Corvairs, I took every opportunity to explain that philosophically we were going to emulate every single successful thing we could from Lycoming and Continental, (with the exception of their price structure.) If this alienated or excluded a fringe element who had a rabid desire to demonstrate “how stupid Lycosaurus engines are”, I am not the least bit sorry. People like that were bound to give alternative engines a black eye, at least I could discourage them from using a Corvair to do it. The positive corollary is that we also made sure that the Corvair was well-known as the alternative engine of choice among people who practiced and respected traditional craftsmanship. 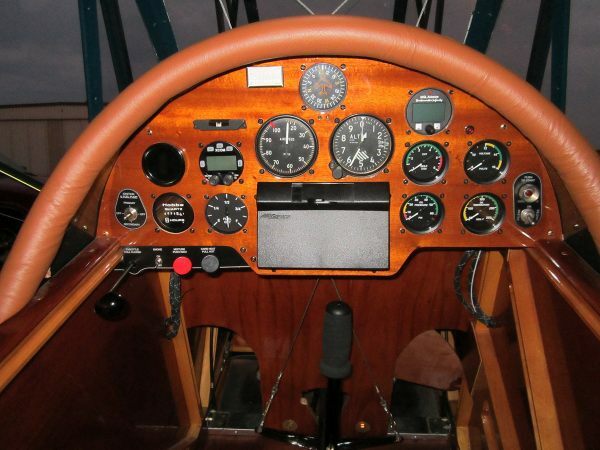 This brought in countless builders who believe the original motto of the EAA, “learn, build and fly.” Trust me, this is one of the greatest personnel trades in the history of team building. The good people we attracted by highlighting the work and efforts of builders who valued a mixture of tradition an innovation are infinitely more valuable fellow builders than the handful of ‘special’ people who moved on the other unfortunate engines. If you would like a clear picture of the reward of having a movement that champions genuine craftsmanship, get a good look at Mike’s plane. Any aviator who sees this aircraft in person will have an increased respect of Corvair building in general; Builders like Mike give all of us a better standing when we say “I’m building a Corvair” in any aviation setting. His workmanship is a direct example for other Piet builders. In addition all this, I like the fact he built the plane with his dad best of all. 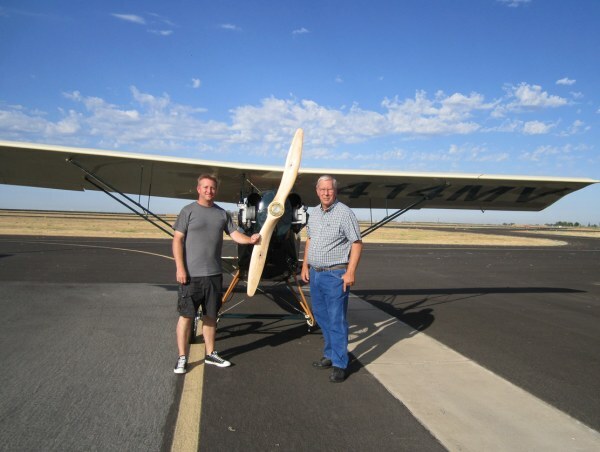 Hats off to Mike and Vic Groah, Father and son Pietenpol builders and flyers. – ww.